Bacterial leaf blight of carrot is caused by Xanthomonas campestris pv. carotae and is a common disease wherever carrot is grown. It is particularly important in areas of frequent rainfall or extensive sprinkler irrigation. 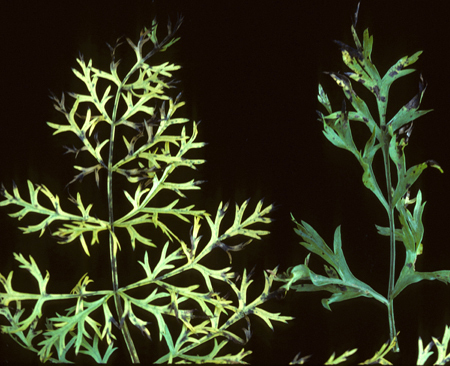 Symptoms appear primarily on leaf margins as small, yellow, angular leaf spots which expand, turn brown to black with a yellow halo, and become dry and brittle. Leaflets may become distorted and curled. Symptoms can extend into petioles, produce a yellow-brown, gummy exudate, and occur on flower stalks. Infected umbels can be completely blighted and seed infection can occur. X. campestris pv. carotae is a common contaminant of carrot seed and can persist in association with infected plant debris in the soil for up to one year. The bacterium is spread by splashing rain, irrigation water, insects, animals, and machinery. Start with certified, disease-free seed or treat seed with hot water (52 ˚C for 25 minutes). Rotate out of carrots for 2-3 years. Plow under infected crop debris after harvest to hasten decomposition.